Key words: Galileo, Global Navigation Satellite Systems, GLONASS, GNSS, GPS. The surveying and mapping industry has been revolutionised by the use of Global Navigation Satellite Systems (GNSS), involving satellites, ground reference station infrastructure and user equipment to determine positions around the world. The Global Positioning System (GPS) from the USA is the best known, and currently fully operational, GNSS. Russia also operates its own GNSS called GLONASS. Fuelling growth in the coming decade will be next generation GNSS, and space augmentations of these that are currently being developed. The USA is modernizing GPS, Russia is revitalising GLONASS, and Europe is moving ahead with its own Galileo system. Watershed advances in a major technology like GNSS only occur in 20 to 30 year cycles. Therefore it is now an opportune time to explore potential opportunities and issues for the spatial information industry. The first part of the paper outlines how the next generation of GNSS will bring extra satellites and signals to deliver better accuracy, reliability and availability. Extra satellites will make possible improved performance for all applications, and especially where satellite signals can be obscured, such as in urban canyons, under tree canopies or in open-cut mines. In its various modes, modernized GNSS will also deliver higher accuracy and improved speed-to-first-fix for carrier phase-based positioning. For example, the European Union's (EU) Galileo system will offer a Commercial Service that will be capable of delivering 0.1m accuracy without a direct link between the user and ground reference stations. The extra satellites and signals will improve the performance and reliability for all applications right down to the centimetre accuracy techniques used in surveying and geodesy. The second part of the paper looks at some of the implications of these improvements for the service providers of continuously operating reference stations (CORS), as well as for survey users. For example, the EU's Galileo system is much more open to civilian and commercial involvement, and allows for regional and local augmentation to the core system. How will current CORS infrastructure be able to cope providing differential positioning services to users tracking a combination of GPS, Galileo and perhaps GLONASS signals? What is the benefit of the modernized GPS L2C signal? Will mixed GPS/Galileo RTK services be possible? Global Navigation Satellite Systems (GNSS) involve satellites, ground stations and user equipment to determine positions around the world and are now used across many areas of society. Among currently used GNSS, the Global Positioning System (GPS) from the USA is the best known, and currently fully operational, GNSS. Russia also operates its own GNSS called GLONASS. A European Commission report claimed that the GNSS industry in 2001 had a global turnover (equipment and applications) of 15 billion Euros. The report forecasts this to rise to 140 billion Euros by 2015. It also identifies North America, Europe and the Pacific Rim as the dominant markets for the next 5 years. Fuelling growth during the next decade will be next generation GNSS that are currently being developed. Major components are the USA’s modernized GPS and Europe’s planned Galileo system. Watershed advances in a major technology like GNSS only occur in 20 to 30 year cycles, therefore this is an opportune time to explore potential opportunities and issues for the spatial information industry. GPS broadcasts two signals in the so-called L1 and L2 bands: L1 at 1575.42MHz and L2 at 1227.60MHz. GPS receivers can make pseudorange or carrier phase measurements, on the tracked L1 or L2 signals. Civilians using low-cost receivers only have direct access to the L1 signal, using the so-called Course Acquisition Code (C/A-code). This means that such receivers are unable to correct for delays to the signal as it passes through the ionosphere, which is now the dominant cause of error for users. PPS receivers can access the ranging code (the Precise or P-code, now encrypted as the Y-code under a policy of Anti-Spoofing) on both the L1 and L2 signals, which enable them to correct for ionospheric errors. Civilian users have access to the Standard Positioning Service (SPS), whereby the C/A-code allows direct L1 measurements to be made. Specifying the accuracy of the SPS depends on many factors. Recent testing has shown that typically available accuracy from the SPS is often less than 10m. However, it should be noted that the officially stated standard for worst case horizontal positions using the SPS and based only on the signals in space (ie ignoring local conditions) is less than or equal to 22m at the 95% confidence level. The equivalent value in height is less than or equal to 77m. The Precise Positioning Service (PPS) enables enhanced accuracy and availability that is not available to civilian users by permitting the direct measurement of pseudorange on both the L1 and L2 signals using the Y-code. It is designed for the US and allied military, and for certain authorised US agencies. Single Point Positioning (SPP) is the technique for which GPS was originally designed and delivers the SPS performance mentioned above. Differential GPS (DGPS) can overcome some of the limitations of GPS by applying corrections to the basic pseudorange measurements, based on a receiver making measurements at a known point (a reference station). The accuracy achievable from DGPS can range from a few metres down to few decimetres, depending on the quality of the receiver and the DGPS technique used. GNSS Surveying also works differentially but can achieve centimetre accuracy using a special measurement technique. A typical receiver, for both SPP and DGPS, measure the ranges to the satellites by timing how long the signal takes to come from the satellite (the pseudorange, referred to as such because this measurement is contaminated by the receiver clock error). However, receivers used in surveying and geodesy measure the phase of the underlying carrier wave signal (the so-called carrier phase). For baselines between points separated by more than (say) 20km, it is important that such receivers can also correct for the ionosphere. Given that civilian users only have access to the SPS, surveying receivers employ sophisticated signal processing techniques to measure the phase of L2 signal. This level of sophistication is a major reason why surveying receivers are more expensive than receivers used for SPP and DGPS. It is intended to introduce an improved code (instead of the current C/A-code) on the L2 frequency of GPS (the so-called L2C) to enable civilian receivers to better account for ionospheric error, as well as to be more immune to RF interference and multipath. The first Block IIR-M satellite to broadcast L2C was launched at the time of writing this paper (October 2005). The launch schedule to replace existing satellites is difficult to predict but full operational capability for L2C will not be until all 24 satellites (a combination of 8 Block IIR-M and 16 Block IIF satellites) in the constellation are broadcasting the new signal. Under currently published plans, that is not expected to occur until 2013 or beyond. The radio spectrum for the L2 signal is not fully protected through the International Telecommunications Union. This means that L2C cannot be relied upon for so-called safety of life applications such as in civil aviation and emergency service operations. Therefore, a third civil frequency at 1176.45MHz (called L5) is planned for launch on the Block IIF satellites. The first Block IIF launch is scheduled for 2006, with full operational capability unlikely until 2015. GPS-III, which will incorporate the extra L2 and L5 signals of the Block IIR-M and Block IIF satellites, will have additional features (still under study) which will enable it to better ‘compete’ with Galileo. However, to preserve ‘backward compatibility’ with legacy user equipment, all current and planned Block II signals will also be broadcast. The 30 GPS-III satellites are planned for launch from about 2013 until 2018. Perhaps the single most important shortcoming of GPS is also its most obvious; there are some places where GPS simply does not work due to a lack of available satellites. Therefore, while GPS Modernization will have a significant impact, a major influence in the future will be systems offering additional satellites to those offered by GPS alone. We may therefore think in terms of a generic, overall GNSS combining a number of sub-systems. GLONASS was originally deployed as the Soviet Union’s answer to GPS. The design of GLONASS is very similar to GPS except that originally each satellite broadcast its own particular frequency with the same codes. GPS satellites broadcast the same frequencies and a receiver differentiates between satellites by recognising the particular part of the codes broadcast by a given satellite (this is known as a CDMA, or Code Division Multple Access, scheme). GLONASS can also provide a different level of service to Military users compared to Civilian users. For a detailed description of GLONASS see UN Action Team on GNSS . Current status information is available from the Russian Federation Ministry of Defense web site at GLONASS . Current activity centres on launching GLONASS-M satellites with an improved 7-year design lifetime, which will broadcast in the L1 and L2 bands. From 2007 to 2008 it is planned to launch GLONASS-K satellites with improved performance, which will also transmit a third civil signal (L3). The stated intention is to achieve a full 24-satellite constellation transmitting two civil signals by 2010. The full constellation is planned to be broadcasting three sets of civil signals by 2012. It is worth noting that at the end of 2004 the Indian Government announced it would be contributing funds to assist Russia revitalise GLONASS. Survey-grade receivers capable of tracking both GPS and GLONASS have been available for some time. These combined receivers have demonstrated a marked improvement in reliability and availability in areas where satellite signals can be obstructed, such as in urban areas, under tree canopies or in open-cut mines. The Quasi-Zenith Satellite System (QZSS) is a multi-satellite augmentation system proposed to the Japanese government by a private sector consortium. The plan is to launch at least three satellites broadcasting GPS-like (and perhaps Galileo- and GLONASS-like) signals in an orbital configuration that increases the number of satellites available at high elevation angles over Japan (hence the term “quasi-zenith”). This would benefit modified GPS receivers operating in areas with significant signal obstructions such as urban canyons. It is expected that a demonstration QZSS satellite will be launched in 2008. For a detailed description of QZSS see UN Action Team on GNSS  and Tsujine . The orbital configuration of the QZSS constellation is such that the satellites will also pass over parts of the Asia-Pacific region (the satellites must be launched into a geostationary altitude). That will effectively increase the number of satellites available to suitably equipped GPS users in that region. The design calls for a constellation of 30 satellites in a similar orbital configuration to GPS, but at an increased altitude (approximately 3000km higher than GPS) which will enable better signal availability at high latitudes. While the Galileo design aims for a level of interoperability with GPS, some aspects are not compatible. The exact signal structure has not been finalised but Galileo satellites will broadcast signals compatible with the L1 and L5 GPS signals. Those Galileo signals are designated as L1, E5a and E5b. Galileo will also broadcast in a third frequency band at E6; which is not at the same frequency as L2/L2C GPS. The Open Service uses the basic signals, free-to-air to the public with performance similar to GPS and GLONASS. The Safety of Life Service allows similar accuracy as the Open Service but with increased guarantees of the service, including improved integrity monitoring to warn users of any problems. The Public Regulated Service is aimed at public authorities providing civil protection and security (eg police), with encrypted access for users requiring a high level of performance and protection against interference or jamming. The Search and Rescue Service is designed to enhance current space-based services (such as COSPAS/SARSAT) by improving the time taken to respond to alert messages from distress beacons. The Commercial Service allows for tailored solutions for specific applications based on supplying better accuracy, improved service guarantees and higher data rates. The Galileo ground segment has elements similar to the GPS global network of tracking stations and its master control station. With GPS, under the firm control of the US Military, augmentation systems to improve accuracy or reliability are operated completely external to the GPS architecture. Such services are available from third parties such as FUGRO’s Omnistar or the DGPS beacons provided by the US Coast Guard and the Australian Maritime Safety Authority. Galileo, on the other hand, has a much more open architecture, whereby systems to improve service can be brought ‘inside’ the system through a provision for regional elements and local elements. The Galileo system architecture allows for regional Up-Link Stations to facilitate those improved services tailored to local applications in certain parts of the globe. Galileo is to be operated by a Civilian Agency and the business-operating model is more open than in the case of GPS. Galileo uses a Public Private Partnership (PPP) whereby the European Commission owns the physical system (satellites, ground stations, etc) as a public asset, but a Concessionaire will be responsible for the day-to-day operation. The business model is still being developed, however the Concessionaire will probably seek to cover costs and generate profit through the Commercial Service, while also delivering agreed service levels for the other four services. At the time of writing (mid-2005) the two consortia previously bidding for the Galileo concession have joined forces and have begun negotiations with the European Commission. Galileo has moved out of its development phase and into the In Orbit Validation (IOV) phase. A contract has been let for the four satellites required during the IOV phase, with the first launch expected in late-2005 or early-2006. The full constellation should be launched between 2006 and 2008, with full operational capability by 2009, though these dates may slip a year or two. It can be seen from the above descriptions that the next generation GNSS will bring significant improvements compared to the currently available systems. In ten years time there may be as many as 80 satellites from GPS, GLONASS, Galileo and QZSS, broadcasting a variety of signals and codes, which can be used by suitably equipped users anywhere on the globe for a range of navigation and positioning applications. QZSS will also add three or more satellites for users in the Asia Pacific region. The L1 signal alone is sufficient for many mass-market applications requiring an accuracy of (say) 3 to 10 metres. The availability of many more satellites will enable new applications in areas where the current lack of satellites has been a hindrance to market growth. A global snapshot of the satellite visibilities for GPS-only, combined GPS/GLONASS, combined GPS/Galileo and combined GPS/GLONASS/Galileo scenarios are presented in Figure 1. 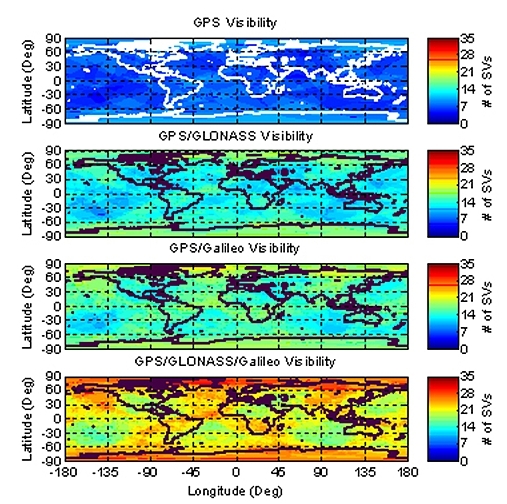 The global simulation was carried out by computing single-epoch snapshot solutions for 1200h on 27 May 2005 at 1 degree intervals of latitude and longitude, and an altitude of 50m, using a 15° masking angle. Orthographic global colour maps are ideal for displaying spatial variations. The average satellite visibilities, excluding the high latitude areas, are approximately 6, 12, 15 and 21 for GPS, GPS/GLONASS, GPS/Galileo and GPS/GLONASS/Galileo scenarios respectively. The visibility improvements of the combined systems with respect to GPS-only are therefore approximately 200%, 250% and 350% for GPS/GLONASS, GPS/Galileo and GPS/GLONASS/Galileo respectively. Figure 1. Global snapshot of satellite visibility with 15° masking angle (1200h 27 May 2005). GPS and GLONASS combined have already demonstrated the benefits of extra satellites, and Galileo brings all that and more. The benefits of the expected extra satellites and their signals outlined above can be categorised in terms of continuity, accuracy, efficiency, availability and reliability. GPS, QZSS and Galileo being independent GNSS means major system problems, unlikely as they are, are a very remote possibility of occurring simultaneously. More satellites to observe means a given level of accuracy can be achieved sooner. More signals means more measurements can be processed by the receiver’s positioning algorithm. Position accuracy is less susceptible to the influence of satellite geometry. The effects of multipath and interference/jamming are mitigated, meaning the measurement quality is higher. Galileo also has the ability to deliver improved DGNSS accuracy directly, in the receiver via the RF frontend, through the Commercial Service. For carrier phase-based positioning, to centimetre accuracy, the extra satellite signals will significantly reduce the time required to resolve ambiguities. Improved ability to work in areas where satellite signals can be obscured, such as in urban canyons, under tree canopies, open-cut mines, etc. A ‘hot’ research topic is indoor GNSS. Some receivers are now capable of measuring GPS signals inside buildings, and an increase in the number of available satellites will make indoor positioning more robust. With extra measurements the data redundancy is increased, which helps identify any measurement outlier problems. The new measurements will be more independent than the current L1 and L2 measurements, because code-correlation techniques (based on a knowledge of the PRN modulating range codes) will be used, rather than the current ‘codeless/cross-correlation’ techniques employed in today’s dual-frequency GPS receivers. The current L2 GPS measurements by survey-grade receivers are more noisy and less continuous than those expected to be made on either of the new signals L2C or L5, hence reliable dual-frequency operation will be enhanced. More signals means that service is not as easily denied due to interference or jamming of one frequency, that may prevent the making of critical pseudorange and/or carrier phase measurements. It should also be emphasised that newer systems, with improved electronics and antennas in the satellites and user receivers, will deliver overall improvements in data quality. One unknown factor, however, is whether the new multi-frequency user receiver antenna will have the phase centre stability of the current Dorne-Margolin antennas used by the International GNSS Service (IGS). There are factors other than just having more satellites that will influence future market growth in devices and services that require positioning/navigation. One important issue is the USA’s E911 policy, and its equivalent in Europe. These introduce a legal requirement that a mobilephone making an emergency call must be capable of being positioned (typically to better than 100m accuracy). This is leading to many next generation mobilephones being equipped with a GNSS capability. An increased availability of GNSS satellites, along with position-capable mobilephones and personal devices, are enabling factors for a predicted boom in so-called location based services. That in turn is driving the development of a range of positioning technologies that can also work inside buildings, hence indoor positioning is a hot topic for research. GNSS is but one technology being touted as the ideal seamless indoor/outdoor positioning system [Rizos, 2005]. All of these factors combined means we are likely to see positioning capability moving from specialised markets such as navigation, surveying and mapping, to something much more available to the general public. In short, position capability is likely to become much more ubiquitous during the coming decade. However, there are also some GNSS issues that will complicate how both the location based services markets and the traditional surveying/geodesy/mapping markets progress. Apart from the low-end requirements of the LBS mass market, specialised applications will require the availability of multiple GNSS frequencies for improved performance. They also require as many satellites as possible delivering the improved capability at any time and in any location. In that context it is important to note that there will not be uniform compatibility across all the GNSS sub-systems in terms of the signals broadcast, and the timing of when new capabilities become available. Considering the timing of when new capabilities will become available, it is important to note that the currently stated time frames for GPS Modernization, GLONASS replenishment, and QZSS and Galileo deployment are not synchronised. Current state-of-the-art techniques in GPS Surveying squeeze centimetre accuracy from the least possible amount of data from the reference and rover receivers in real-time, using all satellites in view and observations of pseudorange and carrier phase on the two L-band frequencies (L1 and L2). Therefore, GPS is already a very good tool for high accuracy applications. In fact to date GPS surveying techniques have concentrated on achieving the best possible accuracy. The advantages from the coming developments to GNSS sub-systems outlined above is that the spotlight will be on improved availability, efficiency and reliability. Experience with real-time GPS surveying shows that performance improves when more satellites are available. Extra signals are not only useful for ionospheric correction; they also increase the number of observations available for ambiguity resolution, which delivers high accuracy sooner and with greater reliability. Therefore, dual-frequency measurements have proved very useful in GPS surveying, hence being able to use three frequencies will increase performance even more. Any extra signals carrying a civilian code can be accessed by less complicated receivers than is currently the case. This should lead to a new generation of less expensive receivers capable of delivering high accuracy. The techniques employed in real-time GPS surveying are already addressing other applications, including the field of machine guidance servicing construction, mining and agriculture. These industries have high marginal costs and therefore require high levels of reliability and very robust solutions. Therefore, the holy grail for future high accuracy GNSS applications is to have the maximum number of satellites, broadcasting the maximum number of signals, being tracked by the least expensive receivers, delivering the most robust solution. The future is impossible to predict with any certainty, but the following are ‘snapshots’ (at five-year intervals) of how high accuracy applications may develop. All GPS receivers measure the carrier phase on L1 easily, but use more complex and less optimal ‘codeless / cross-correlation’ signal processing techniques to track the L2 frequency. Some are able to track L2C once satellites are available. Two companies offer receivers that can track both GPS and GLONASS signals. These offer higher availability in difficult environments where there are signal obstructions, as in deep opn-cut mines. There could be GPS-only receivers measuring the carrier phase on L1, codeless L2 plus L2C and L5 when satellites are available. Galileo-only receivers measuring the carrier phase on L1, E5 and E6 from a full, or near full, constellation. ‘Hybrid’ receivers that are primarily GPS receivers measuring the carrier phase on L1, codeless L2 plus L2C and L5 (when satellites are available), but can also make measurements on the compatible Galileo L1 and E5 signals. ‘Hybrid’ receivers that are primarily Galileo receivers measuring the carrier phase on L1, E5 and E6, but can also make measurements on the compatible GPS L1 and L5 signals. True GNSS receivers measuring the carrier phase on all available GPS and Galileo signals. For hybrid receivers it should be noted that in 2010 there might be more Galileo satellites broadcasting E5 than GPS satellites broadcasting L5. Some hybrid receivers may also be able to track the GLONASS and/or QZSS signals when available. The hybrid receivers will be capable of superior performance compared to receivers using only a single sub-system. However, it is unclear whether there will be a charge on receivers making measurements on the Galileo E6 signals. This wide range of possibilities will cause uncertainty for high accuracy users as different receiver configurations ‘jockey’ for market dominance. By 2015, GPS should have caught up to Galileo and have a full constellation broadcasting L1, L2C and L5 signals. Some next generation GPS-III satellites will have also been launched. Galileo will continue to offer a full constellation broadcasting L1, E5 and E6 signals. Second-generation Galileo satellites, possibly with improved capabilities, may have replaced some of the original satellites. There will be a combined GPS and Galileo constellation of at least 54 satellites (most likely 60 or so). 10 satellites being available anywhere on the globe at any time will be common place. The market uncertainties in the preceding 10 years should have panned out by 2015 and true GNSS receivers will probably be measuring the carrier phase on most, if not all, of the available GPS and Galileo signals. With full coverage of GPS L2C, the need to measure codeless L2 will have passed, and receivers will have simplified signal tracking technology. This should lead to low-cost receivers measuring carrier phase from the combined GPS/Galileo constellation. When GLONASS and/or QZSS satellites are in view, capability will be further enhanced. The high availability of GNSS signals and the signal protection for L1 and L5 will mean that high accuracy can be relied upon, even for safety of life applications. Integration with other technologies will mean that indoor positioning will be mature and robust. A users’ positioning data will be easily combined with correction data from reference stations delivered either by third party mobile communications or directly into the receiver by the Galileo commercial service. All of this will see a continuation of the trend that began around 2000 for high accuracy positioning applications to move from surveying into other high value and mission critical markets such as machine guidance. By 2015, the days when high accuracy positioning capabilities were the exclusive domain of surveyors will have passed. The ability to position everywhere with decimetre, and even centimetre, accuracy will be widely available and affordable. Therefore, it is likely that by 2015 mass-market location-based services based on high accuracy positioning will be common place. The new GNSS capabilities outlined above will have significant impacts on the spatial information industry. Current GNSS reference station infrastructure will obviously be impacted, but there may also be wider implications for providers and users of the Spatial Data Infrastructure. The growing importance of satellite positioning as an enabling technology across many industries has led to a realisation that Continuously Operating Reference Stations (CORS) are an important part of the infrastructure for the spatial sciences. The establishment of the International GNSS Service (IGS) in 1992 was a significant step toward the provision of such infrastructure on a global basis. The 1990s also saw the introduction of DGPS services to overcome the U.S. policy of Selective Availability, that deliberately degraded the point positioning accuracy available to civilian GPS users. Some augmentation services using CORS are aimed at commercial users generally while others are designed for particular sectors such as maritime or civil aviation users. More recently, public sector organisations responsible for surveying and mapping infrastructure across the globe have begun to establish CORS networks and services to support real-time centimetre accuracy positioning. Networks supporting high accuracy real-time applications; such as SAPOS in Germany and many similar networks around the globe. When will be the right time to move from a CORS network predominantly based on GPS to one covering multiple GNSS sub-systems? How will the market for combined GNSS receivers develop and what services will CORS networks need to provide to service that market? Firstly, current CORS providers are distinguished by the varying levels of service they provide. These distinguishing characteristics will be less obvious as CORS users demand increasing levels of accuracy and reliability. By 2010 it is likely that CORS services will need to deliver the accuracy currently demanded by surveyors AND the reliability currently demanded by safety-of-life users. Secondly, the ability to run a GPS-based CORS network is now well understood with off the shelf hardware and software widely available. With Galileo however, the Concessionaire will have access to the knowledge required to build Galileo reference stations long before such knowledge is available in the public domain. That would enable the Concessionaire to have a significant advantage when it comes to providing services using both GPS and Galileo. These two points lead to a need for much greater collaboration among current CORS providers and a need to account for a major new player in the field of GNSS services: the Galileo Concessionaire. It is important for the spatial information industry to look beyond just being directly involved in GNSS services and to consider the wider implications for providers and users of the Spatial Data Infrastructure (SDI). Delivering the full advantage of GNSS requires a compatible and homogeneous geodetic infrastructure underpinning all SDI. Many developed countries have adopted datums based on the International Terrestrial Reference Frame (ITRF) that are compatible with GNSS. An example is the adoption of the Geocentric Datum of Australia (GDA), which has been an important initiative for GNSS campatibility. Many areas of the world (especially developing countries) are not so well prepared and a suitable geodetic infrastructure is still not available. However, the IGS does have a global infrastructure in place to help propagate the International Terrestrial Reference Frame to such countries. In many areas even the most recently established datums are fixed in time (in terms of plate tectonics), as for example the GDA. This will become problematic when users are able to position themselves with an accuracy equivalent to a few years of the motion of the underlying tectonic plate (typically several centimetres per year). Establishing a GNSS-compatible datum is only the beginning. If applications such as location-based services are to thrive, it is important that all major spatial data sets are moved onto that datum in a way that maintains the accuracy of the original spatial data set. These issues are becoming important for applications outside SDI’s traditional sphere of influence that are reliant on GNSS and require a seamless geodetic reference frame across the data sets they use. Some applications will be for very demanding users of the SDI, especially safety-of-life applications like Civil Aviation, Emergency Services and Disaster Management. This leads to a requirement for the providers of SDI around the world (like National Mapping Organisations) to make their geodetic infrastructure and other foundation data sets more compatible and reliable in order to service increasingly demanding GNSS users. Liaison with national neighbours and international associations will be needed to make this a reality. The AFREF Project aimed at a GNSS-compatible and homogeneous geodetic infrastructure for the African continent is shaping up as an excellent example of a framework for such regional cooperation. As mentioned earlier in this paper, the next generation of GNSS will greatly enhance the accuracy and reliability of the positioning task. Integration of other measurements and sensors will also lead to the development of indoor positioning capabilities. Ubiquitous positioning will be combined with high bandwidth mobile communications and increasingly intelligent spatial analysis tools. The SDI in all its aspects will need to support a rapidly expanding number of users needing to analyse increasingly sophisticated specialist data sets, in combination with traditional foundation SDI data sets. Furthermore, users will expect it all to work in real-time on small mobile devices. Perhaps the most pressing issue in relation to SDI is that users will soon be able to position themselves with better accuracy than can be found in many SDI foundation data sets. By 2010, developments such as Galileo’s Commercial Service will be routinely delivering 0.1 metre accuracy directly to users in their handheld receivers. At the same time we will also see centimetre accuracy applications move into mainstream mass-markets. We could see centimetre accuracy location-based services such as real-time engineering design. The accuracy and reliability required in safety-of-life applications could be transferred from aircraft to trains, trucks, buses and cars. It may soon be possible for spatial data and accurate positioning to be brought to bear on reducing road toll. However, issues such as spatial accuracy, data access and institutional arrangements will need to be overhauled before the SDI can support users of location-based services demanding such high standards of accuracy and reliability. The spatial information industry industry has been revolutionised by the use of Global Navigation Satellite Systems. The Global Positioning System is the only currently fully operational GNSS, although Russia also operates its own GNSS. Fuelling growth in the coming decade will be next generation GNSS, and space augmentations of these, that are currently being developed. The USA is modernizing GPS, Russia is revitalising GLONASS, and Europe is moving ahead with its own Galileo system. The first part of the paper outlined how the next generation of GNSS will bring extra satellites and signals to deliver better accuracy, reliability and availability. Extra satellites will make possible improved performance for all applications, and especially where satellite signals can be obscured, such as in urban canyons, under tree canopies or in open-cut mines. In its various modes, modernized GNSS will also deliver higher accuracy and improved speed-to-first-fix for carrier phase-based positioning. The second part of the paper discussed some of the implications of these improvements for the service providers of continuously operating reference stations, for the underlying Spatial Data Infrastructure, as well as for survey users as the market for high accuracy positioning expands into new location-based services. Communications Research Laboratory (2004), “Quasi-Zenith Satellite System - A new Satellite Positioning System of Japan”, Proceedings of 16th Meeting of CCTF, Tokyo, Japan, 1-2 April, http://www.bipm.fr/cc/CCTF/Allowed/16/cctf04-11.pdf. Web site accessed 29 July 2005. Dinwiddy, S.E, Breeuwer, E. & Hahn, J.H. (2004), “The Galileo System”, Proceedings of the European Navigation Conference GNSS 2004, Rotterdam, Netherlands, 16-19 May, 151:1-5. European Commission and European Space Agency (2002) Galileo Mission High Level Mission Definition Version 3.0. http://europa.eu.int/comm/dgs/energy_transport/galileo/documents/technical_en.htm. Web site accessed 27 July 2005.
http://europa.eu.int/comm/dgs/energy_transport/galileo/. Web site accessed 13 July 2005. Lee, H.K., Wang, J., Rizos, C., Barnes, J., Tsujii, T., & Soon, B.K.H. (2002), “Analysis of Pseudolite Augmentation for GPS Airborne Application”, Proceedings 15th Int. Tech. Meeting of the Satellite Division of the U.S. Inst. of Navigation, Portland, Oregon, 24-27 September, 2610-2618. Rizos, C. (2005), “Trends in Geopositioning for LBS, Navigation and Mapping”, Proceedings of Int. Symp. & Exhibition on Geoinformation 2005, Penang, Malaysia, 27-29 September, http://www.gmat.unsw.edu.au/snap/publications/rizos_2005b.pdf. Web site accessed 23 July 2005. Russian Federation Ministry of Defense (2005), General GLONASS, http://www.glonass-center.ru/frame_e.html. Web site accessed 13 July 2005. Tsujino, T. (2005), “Effectiveness of the Quasi-Zenith Satellite System in Ubiquitous Positioning”, Science & Technology Trends, Quarterly Review No. 16, http://www.nistep.go.jp/achiev/ftx/eng/stfc/stt016e/qr16pdf/STTqr1607.pdf. Web site accessed 29 July 2005. US Coast Guard Navigation Center (2005), GPS Modernization, http://www.navcen.uscg.gov/gps/modernization/default.htm. Web site accessed 13 July 2005. Chris Rizos and S. Hewitson are working at the School of Surveying & Spatial Information Systems, The University of New South Wales in Sydney, New South Wales, Australia. Prof. Chris Rizos is Chair of IAG Commission 4 “Positioning and Applications”.